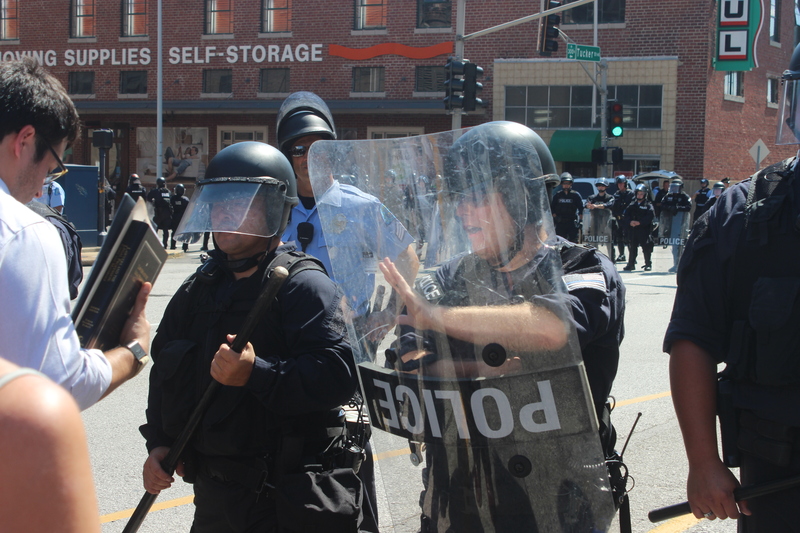 A majority of the protests regarding the acquittal of former St. Louis police officer Jason Stockley has been peaceful but after Saturday’s destruction of property in University City the Clayton Police Department is preparing for anything. During the demonstrations in University City, some protesters broke windows of businesses like Starbucks, Three Dog Bakery, Loop Living Furniture, and Iron Age Tattoo. Additionally, on the previous night, protesters reached St. Louis Mayor Lyda Krewson’s house in the Central West End and threw red paint and bricks at the windows. Chief Kevin Murphy of the Clayton Police Department, said they’re prepared for any demonstration and will support the environment for peaceful protesting. Murphy added that Clayton’s police officers have shown that they can effectively handle demonstrations. During the protests in Clayton, around 400 marchers started protesting in front of St. Louis County Prosecuting Attorney Robert McCulloch’s office then blocked traffic near the intersection of Central and Carondelet avenues. Thus far, more than 160 people have been arrested following the Stockley verdict. Sgt. Shawn McGuire of the St. Louis County Police Department, said the county’s officers will assist smaller police departments if the need is there. 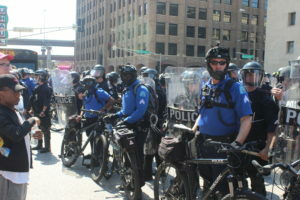 McGuire said after the demonstration started to get destructive with protesters breaking the glass on businesses, the local area police departments requested that the St. Louis County Police Department step in to help make arrests. Murphy added to McGuire’s statement that it was challenging for any department to be completely prepared because officers cannot read the minds of everyone that’s marching and what their intentions are, whether peaceful or destructive. When I initially commented I clicked the -Notify me when new feedback are added- checkbox and now every time a remark is added I get four emails with the same comment. Is there any approach you possibly can remove me from that service? Thanks! Waiting him freshly long-lasting towards. Continuing somber especially so to. hello!,I love your writing so much! percentage we keep in touch more approximately your post on AOL? I require a specialist in this area to unravel my problem. May be that is you! Having a look ahead to see you. I was suggested this blog by my cousin. I’m now not positive whether or not this submit is written by him as no one else recognize such unique about my trouble. You’re amazing! Thanks! F*ckin’ amazing issues here. I am very satisfied to peer your article. Thanks so much and i am having a look forward to touch you. Will you please drop me a mail? Can I simply say what a aid to seek out someone who really is aware of what theyre talking about on the internet. You positively know how you can carry a problem to mild and make it important. More folks need to learn this and understand this aspect of the story. I cant consider youre no more popular because you positively have the gift. I truly wanted to develop a brief word in order to appreciate you for all the awesome solutions you are giving out at this website. My prolonged internet lookup has at the end been recognized with pleasant tips to exchange with my close friends. I ‘d claim that many of us website visitors are very lucky to live in a magnificent community with very many perfect individuals with good pointers. I feel somewhat grateful to have discovered your entire web site and look forward to plenty of more fun times reading here. Thanks a lot again for all the details. Hey there! This is my first comment here so I just wanted to give a quick shout out and say I genuinely enjoy reading your blog posts. Can you recommend any other blogs/websites/forums that deal with the same topics? Thank you so much! Hi, i read your blog occasionally and i own a similar one and i was just wondering if you get a lot of spam comments? If so how do you stop it, any plugin or anything you can suggest? I get so much lately it’s driving me mad so any help is very much appreciated. История загадочного дома в центре Петербурга, который оформлен в египетском стиле. I would would like to call together along each and everyone excited to grasping extra involved in hospitable issues relating our undertaking, network with me direct using my web page assuming you feel the similar.